Robert Taylor, together with two distinguished Battle of Britain Fighter pilots. 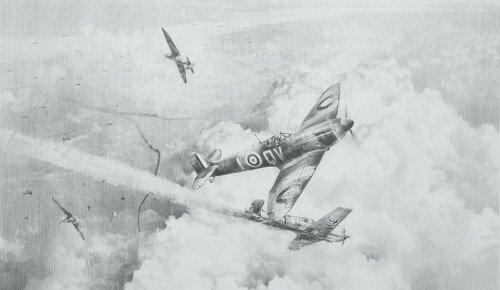 Just after midday on 27 September 1940 one of the bitterest engagements of the Battle of Britain took place in the skies over Kent when the Spitfires of 19 Squadron took on the Bf109s of JG54. In the huge dogfight that ensued, 19 Squadron claimed 8 enemy aircraft destroyed. Robert Taylor’s outstanding drawing is a lasting tribute to the gallant young pilots who fought in the Battle of Britain and with each print signed by Aircrew who participated during those crucial months, this is an outstanding opportunity for all collectors of aviation art and memorabilia.